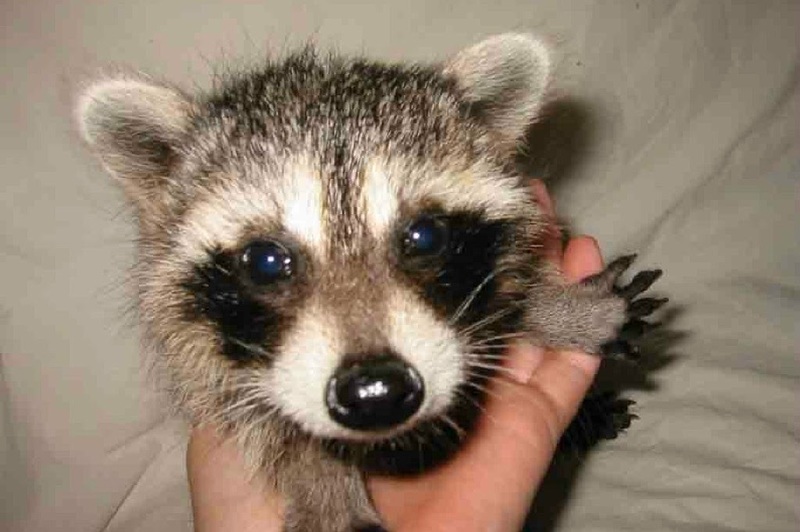 Every year the foundation takes in hundreds of animals; here are a few of our favorites. 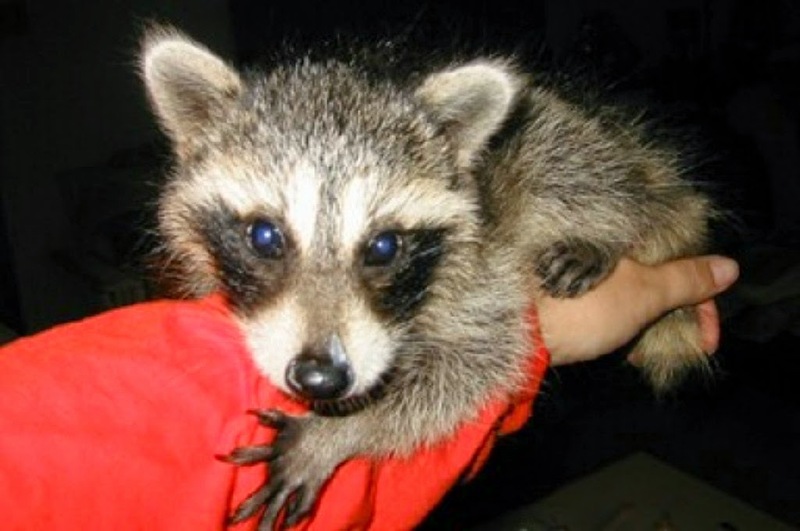 A baby raccoon- one of over 100 we rehabbed last year. 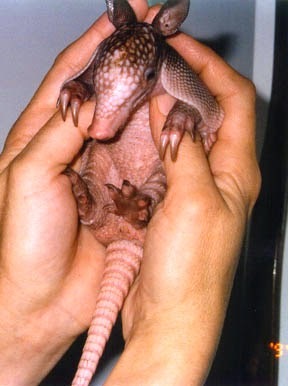 This gives you an idea of just what they look like and how cute and initially dependant upon us they are. As a species of higher intelligence, we keep these animals sometimes up to 9 months or more depending upon their maturity rate. Kitchi (Eskimo for Great Spirit) was always the true alpha wolf of our pack. 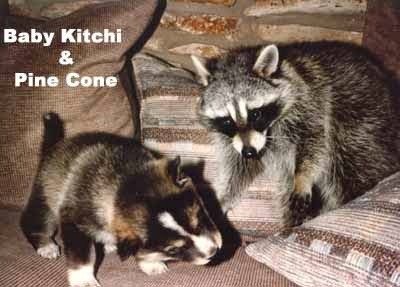 Above: Kitchi guards two baby raccoons. 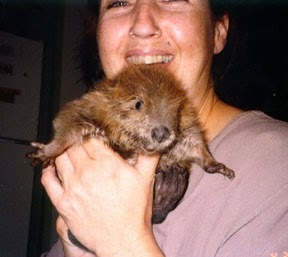 Foundation President Jere Raridon with "Beavis," an orphaned baby beaver who was rescued and transferred to a beaver specialist in North Texas. 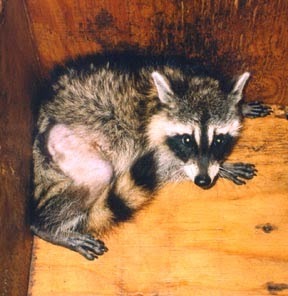 This raccoon was hit by a car and found with a protruding femur. After successful bone graft surgery he was released back to the wild. 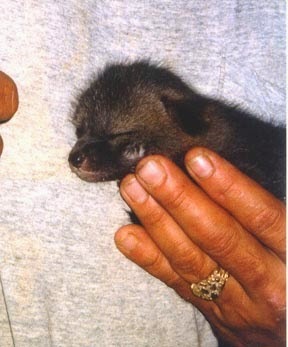 This baby fox was raised and released. 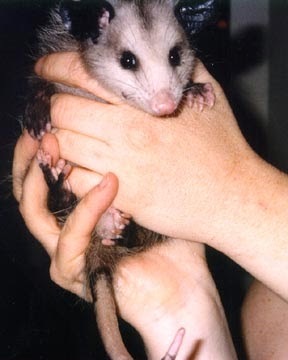 This baby opossum was found in the center medium of Interstate 35. You can read its story on ourtypical day page. Bill hated I-35 and its scary on-ramps. He used to say as he entered highway, "Get the guy that designed this thing and put him in front of a firing squad." If you said, "But he's already dead." Bill simply responded, "I think we should do it anyway just to make sure." Bill also used to have a joke about his mother being Possum Queen. The Seven Dwarves: Photo credit to Susan Granville for this image of the "Seven Dwarves," as we call them, though most should be named either Sleepy, Dopey, or Grumpy! These guys came in June 30, 2004. Susan had seen the mother who hung out regularly on their back patio, eating cat food and other morsels. 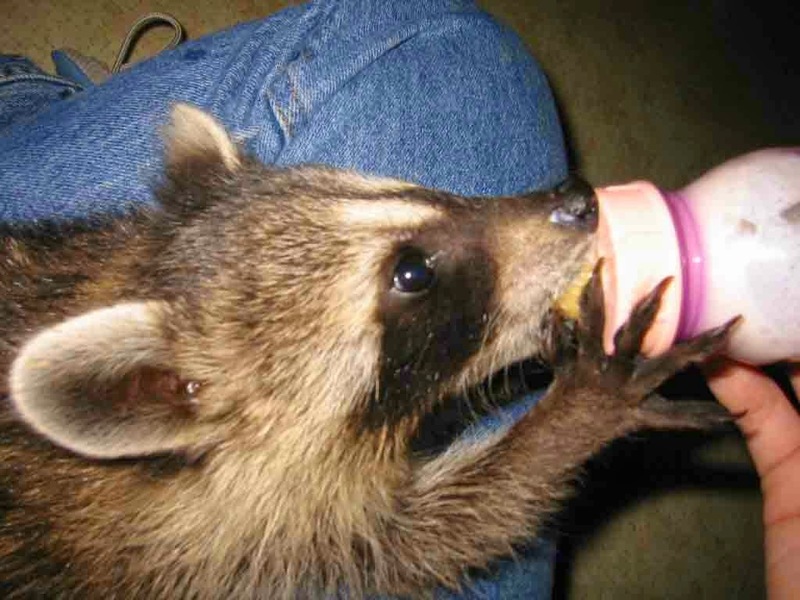 Then one evening she noticed the mother had a large wound on one side and began to worry about her. Not knowing how to trap her, Susan just hoped for the best. 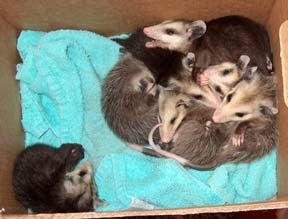 Perhaps Momma opossum knew she had a friend in Susan, as she decided to expire under a potted plant by the back door on the patio, where Susan would surely find her. All seven babies were perched on top of mom and were easily commandeered. Because of her experience, Susan has now decided to learn opossum rehabbing! Hooray! I'm so happy to see that you are doing so much good in the name of such a good guy. At the heart of his comedy (even the most angry comedy) was a strong desire for a better, kinder, more compassionate world. I'm sure that wherever he is, he's proud of your work. I couldn't agree more. He was one of the greatest.